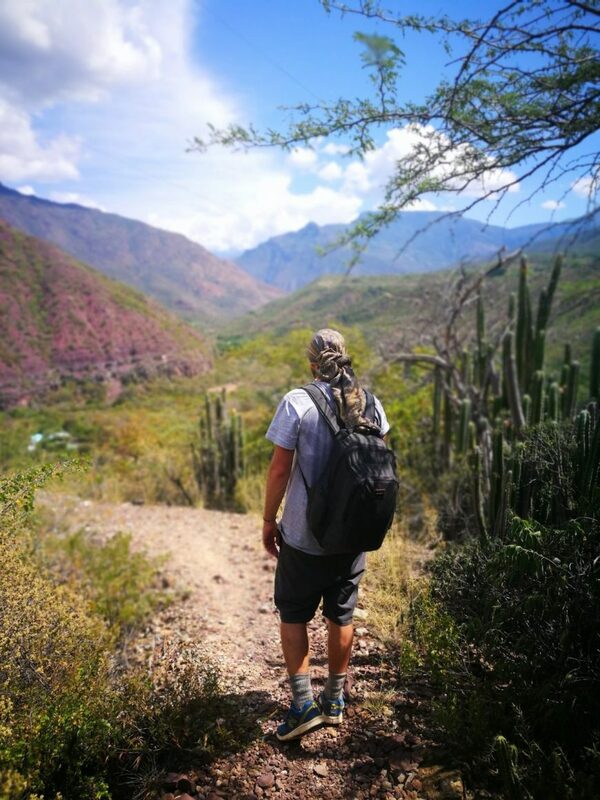 Arriving in Colombia’s adventure capital San Gil we were keen to explore the surrounding area and get a hike in whilst we were there. 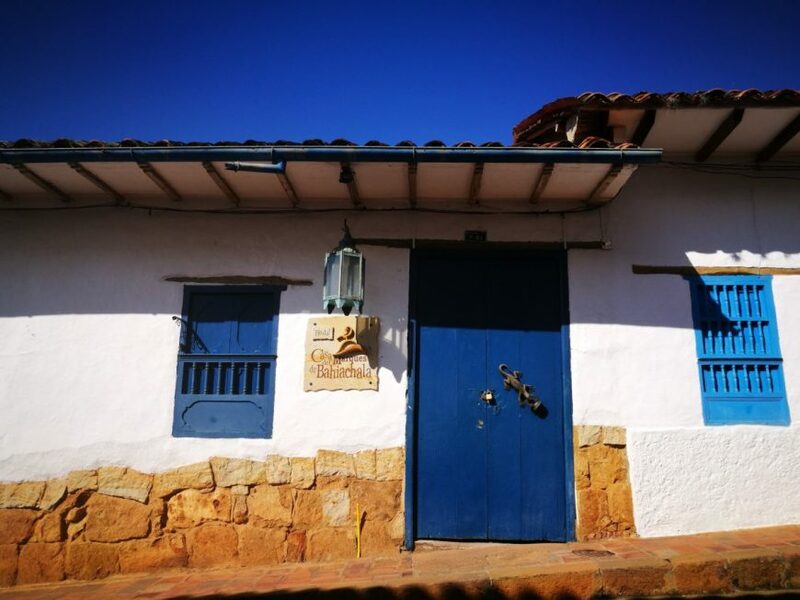 Upon a recommendation we looked into Colombia’s Camino Real spanning though 6 small towns and villages in the Colombian Santander countryside, all the way from Cabrera to Los Santos . 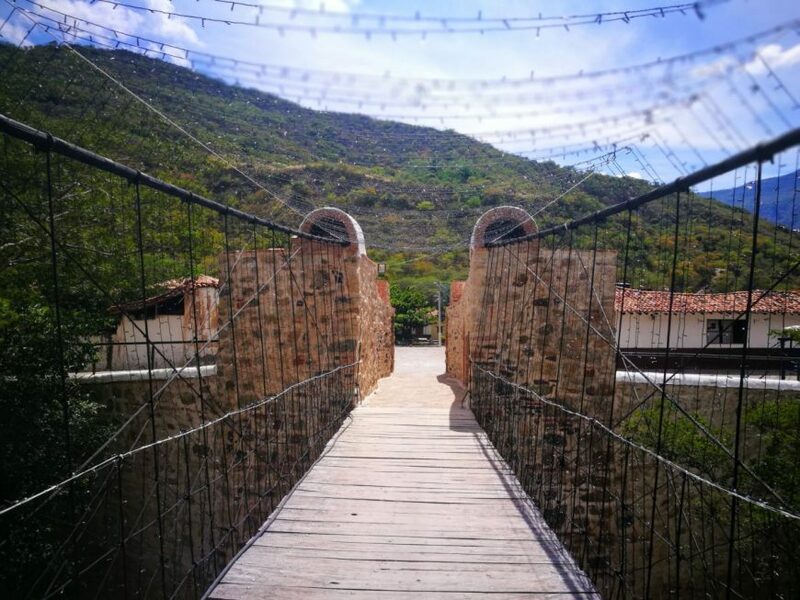 The ‘el Camino Real Colombia’ literally translated means the ‘The Royal Road Colombia’ and was used in the past as a trade route to connect these quaint Colombian places. Our planned hike would take in 5 of the 6 of these villages with an overnight stay in Villanueva over the two days. 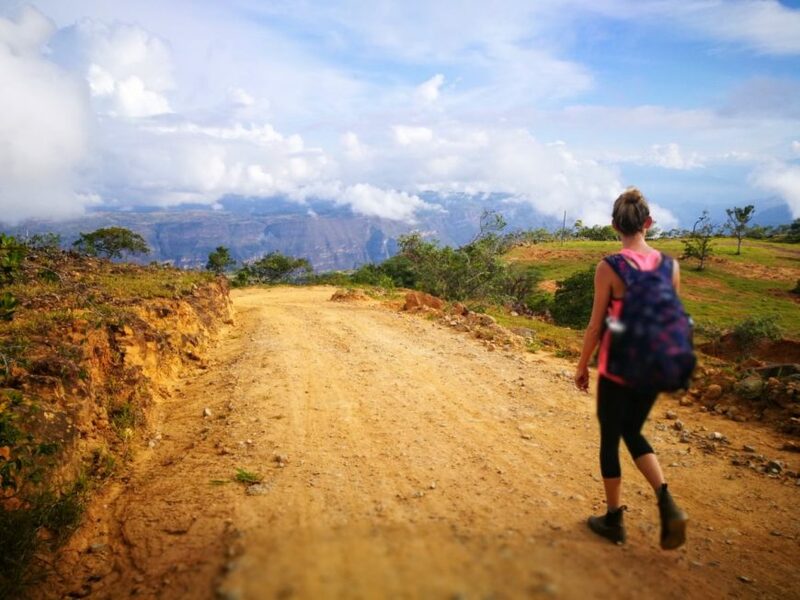 The hike in total is 35km and is truly off the beaten path in Colombia! 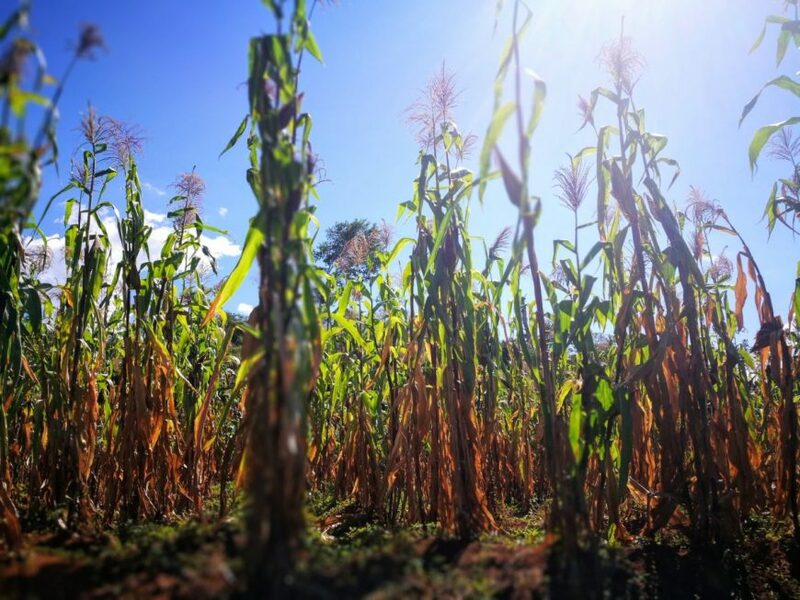 Where to stay – In San Gil we stayed at a great hostel called Sam’s VIP hostel which we would highly recommend. 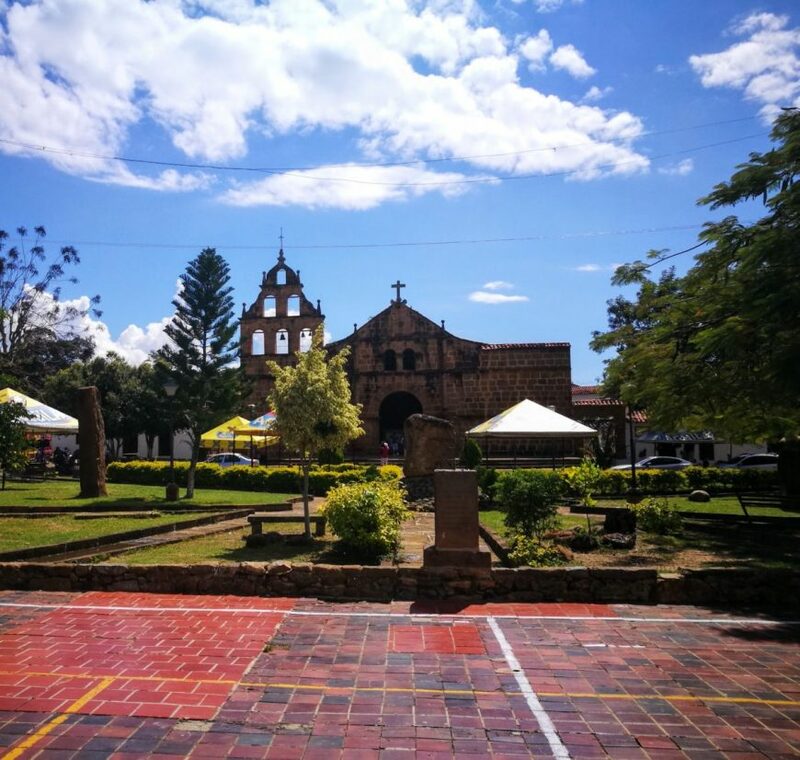 Located right in the centre of San Gil and not far from the bus to Barachara. The perfect place to stay if you are taking on the Camino Real! We caught the bus from the central station in San Gil out to Barichara at 9am, the first village on our list! Arriving in beautiful Barichara the town had a real nice hustle and bustle about it with people going about their everyday business. 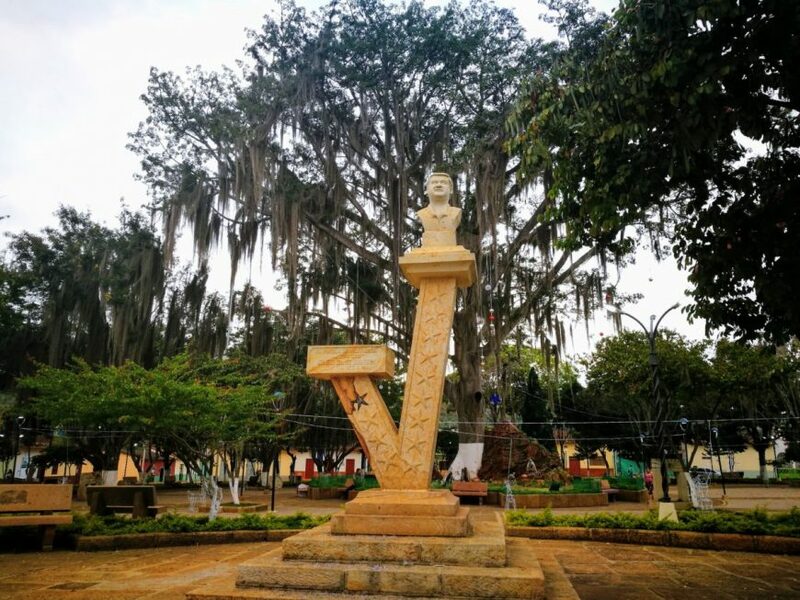 The town also has a little park in the main square complete with fountain that is a great place to sit and relax for a while. 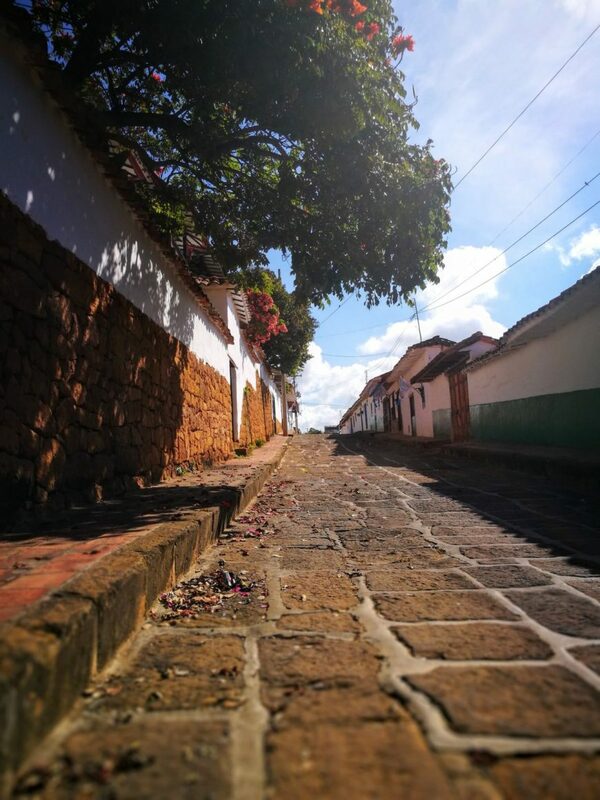 We were instantly blown away by Barichara and its relaxed but small bustling vibe and knew we were in for a treat for the next two days on the Colombian Camino Real. 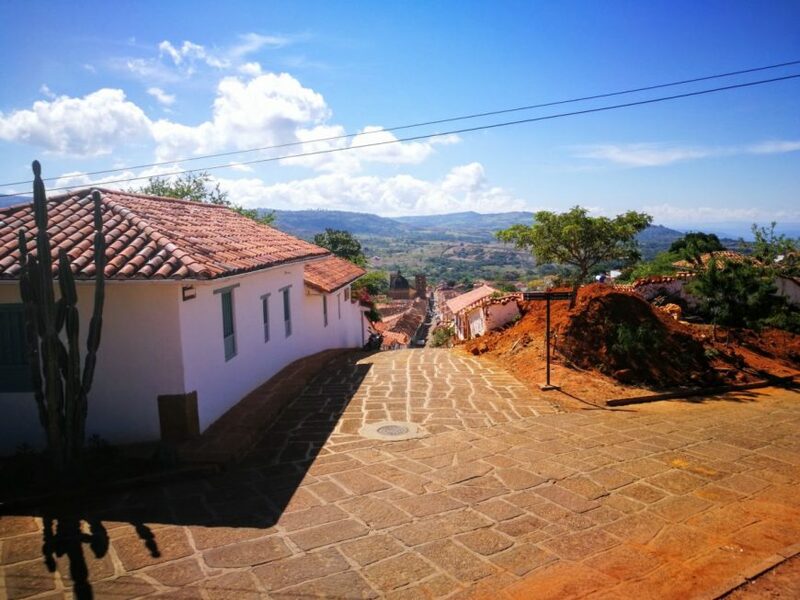 After wandering round the town for an hour and taking in the sites and points of interest we were excited to crack on and pick up the Camino Real from Barichara to Guane. Using our trusty Maps.me app for guidance we headed on! 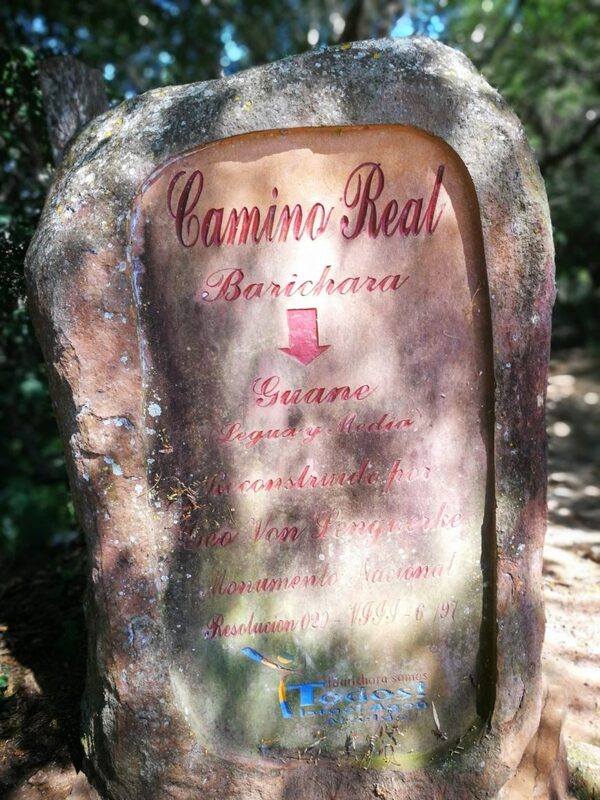 Starting the Camino Real in Barichara to Guane there are some easy uphills, downhills and some epic scenery. Wandering past some alluring but minimalist family houses and farms. 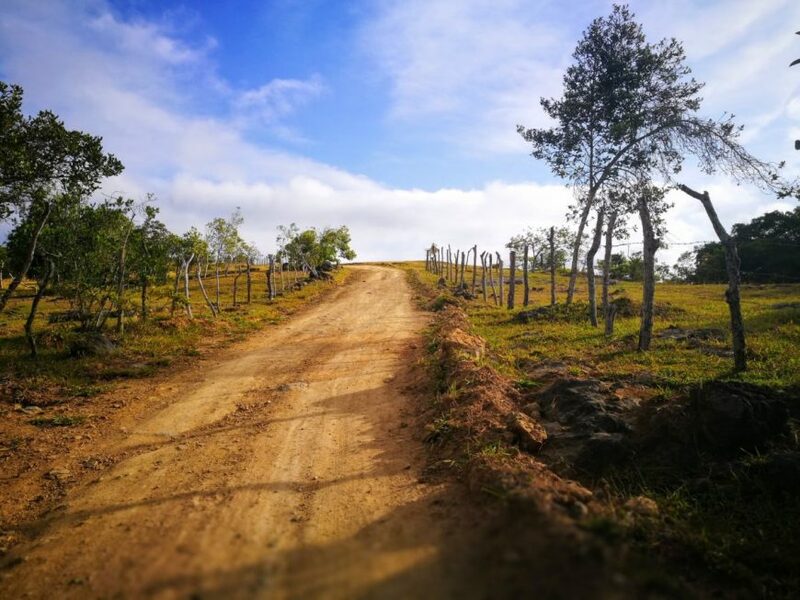 This stretch of the Colombian Camino Real can be done as a day trip with transport back from either Barichara or Guane if you choose. 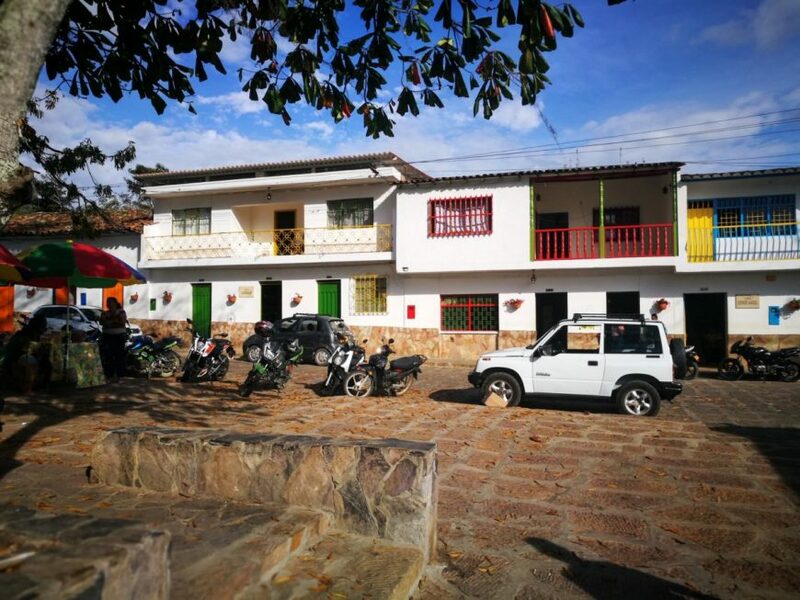 We arrived in Guane to be greeted by a small local girl asking us in Spanish if we were lost and wanted to know where the Church was. Using our conversational Spanish we replied thanking her and in awe of another beautiful fascinating village, that literally looked like something straight out of a story book. 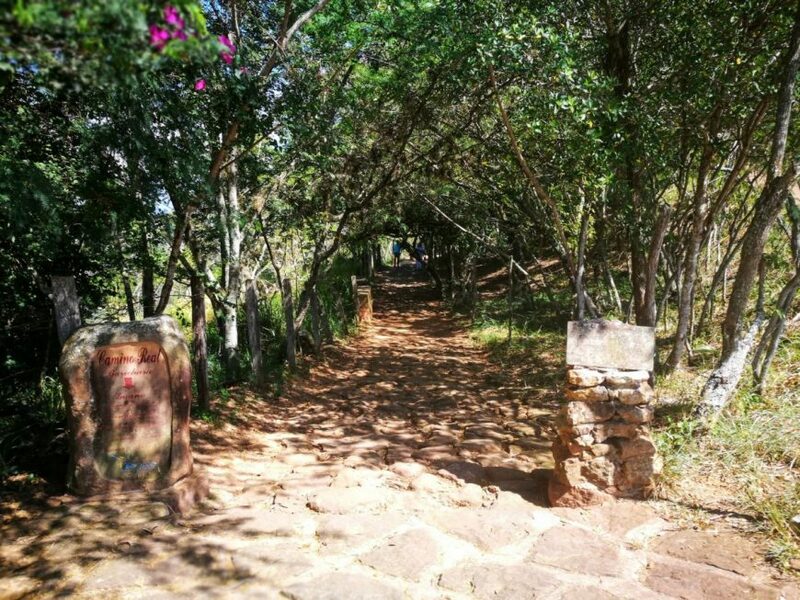 From Guane to Villanueva there is a moderate uphill climb for most of the journey. 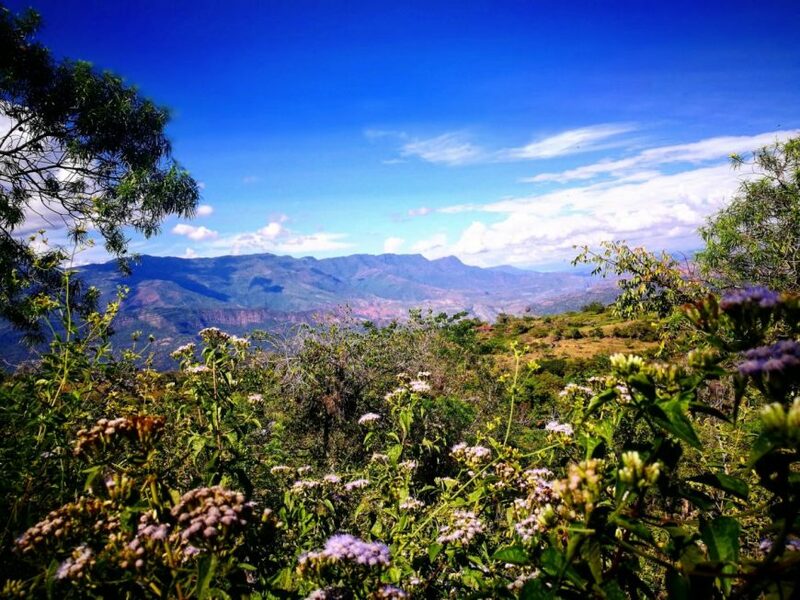 Boasting open farm land and continuous stunning views of the gorgeous Colombian landscape. It gets more wow with every step with new vistas to been taken in on every turn. 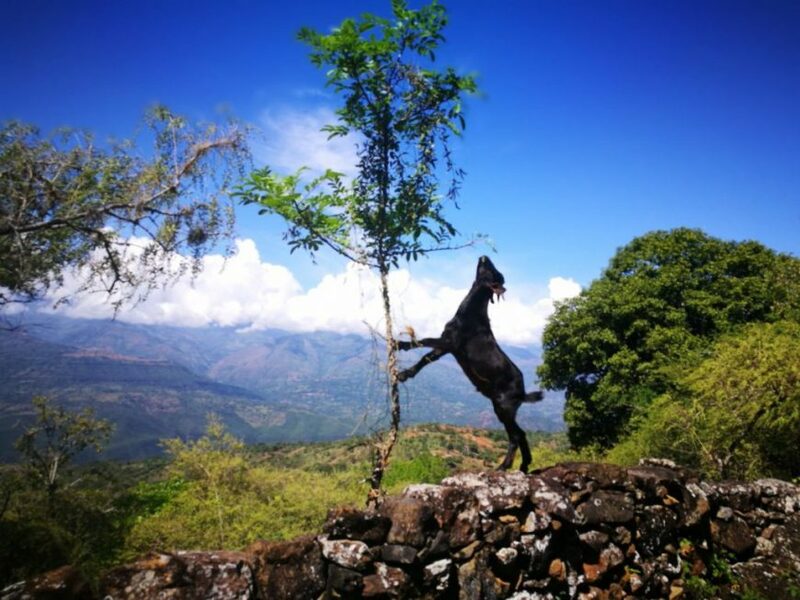 TIP – Upon reaching the summit of Filo Tierranegra there are a few routes that split off in different directions and it can be hard to follow the trail, as the earth has been moved and the trail goes a little cold. Once reaching the top the road splits left and right. Turn left, then after 10-20 yards or so the trail will pick back up on your right hand side headed down into the man-made black sand dunes and into a wooded area where you should see the trail pick back up again on the floor. 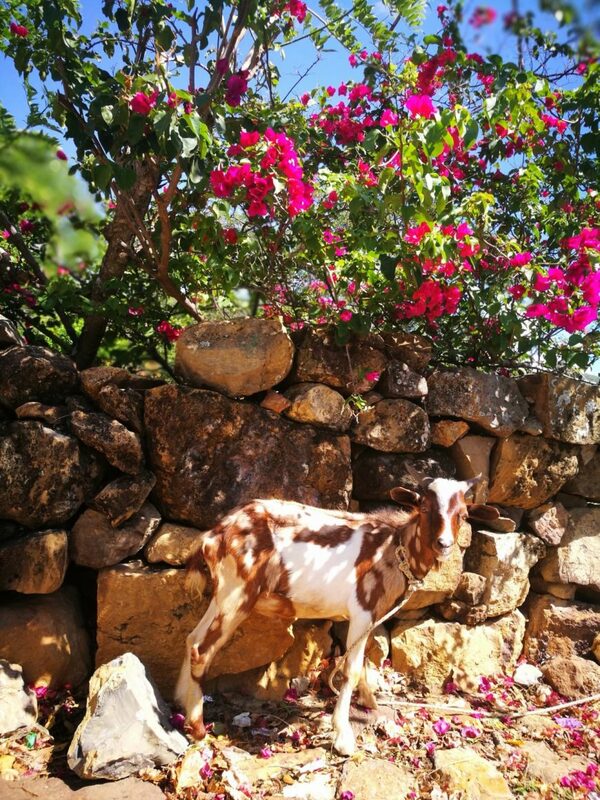 This threw us and upon spending a short while walking in the wrong direction and being charged at by a baby cow we managed to escape injury by jumping over a barbed wire fence & then scrambled back to a nearby house to ask for directions. Close call that sticking to the path in the first place would have definitely avoided! After spending most of the day walking uphill we descended down into Villanueva arriving at dusk. There is definitely something special about arriving in a town by walking. Especially when it is into a town that rarely gets tourists or visitors. This was something extra special and we were blown away by the untouched feel of Villanueva. 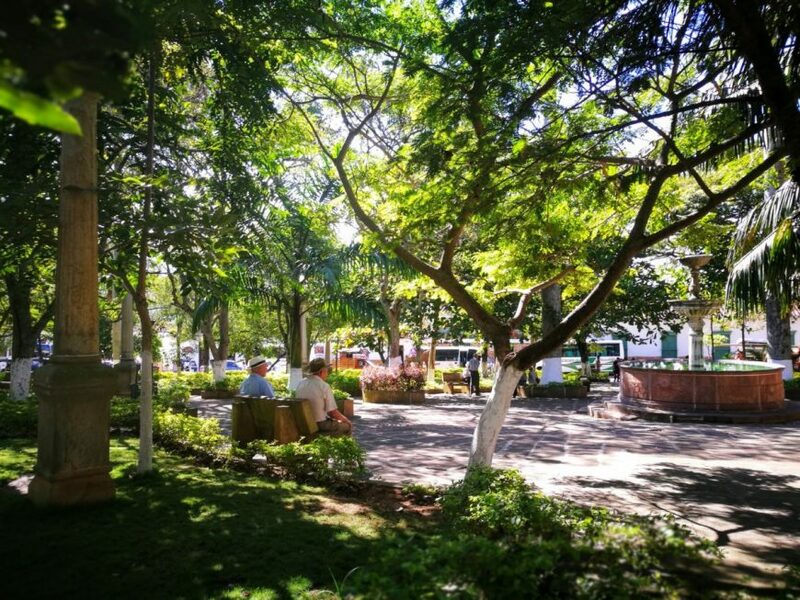 The locals were surprised to see us but loved having us there, walking through the Parque Principal we got some smiles and one local gentleman even got the beers in for us in the local bar! Note: There are not many places to stay in town, we opted for a small, family run hotel which we found when we arrived. 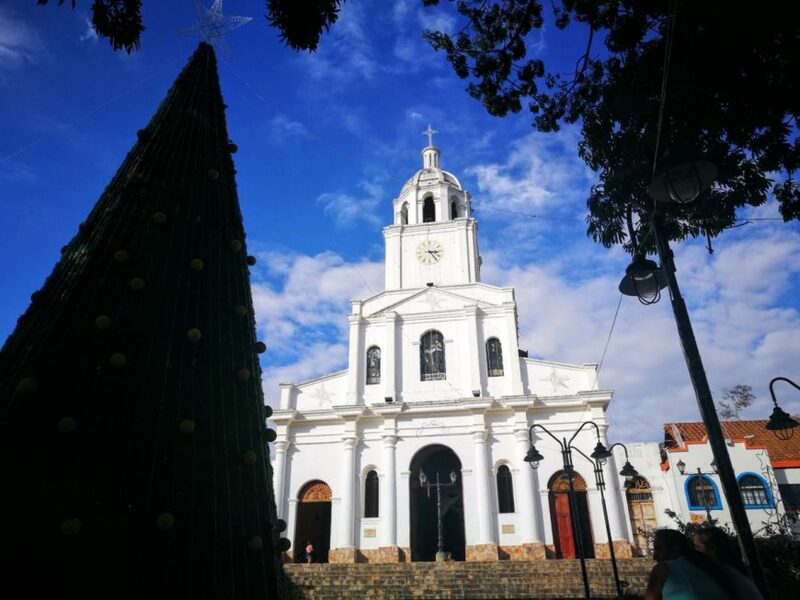 If looking at the church on Parque Principal it is off just on the street to the left hand side & cost us 25,000 COP for the night. We set off from our hotel at 5.30am excited for another day on the Camino Real. Heading through Villanueva we were surprised to see the whole church full for mass on a Sunday at 5.30. Exiting through the north of the village we set of for our final destination of Los Santos via Jordán. Around lunchtime the scenery really opened up and we could see in the distance a huge canyon approaching. 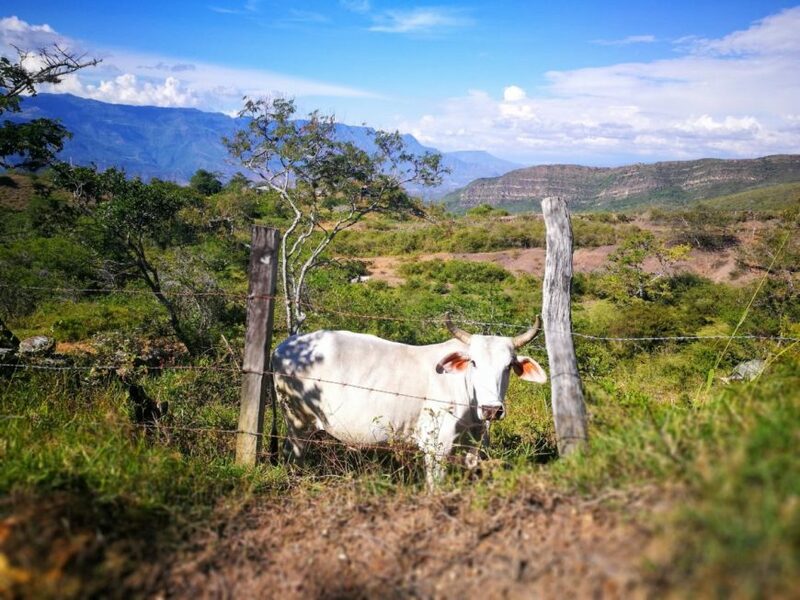 We stopped for lunch at the top of the Mirador del Canyon de Chicamocha with stunning views of the huge canyon and miles and miles of untouched Colombian countryside. We spent a good hour or so here taking in the gorgeous scenery before heading on. We descended down into the canyon approaching the midday heat taking regular rest breaks as there wasn’t much wind and little shade from the sun. Entering Jordán we stopped at a local shop for a snack, soft drink and stock up of water. 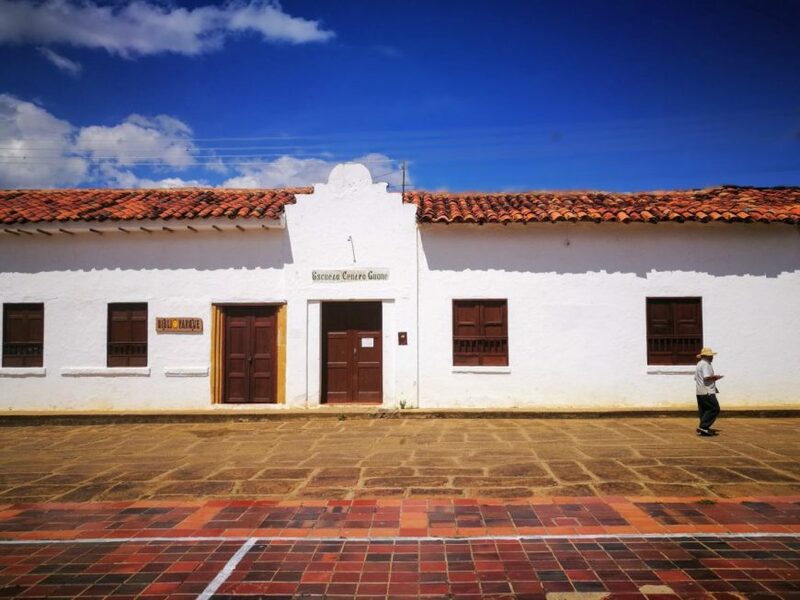 We were surprised to see not much in Jordán, just a few locals and main square, church and place to stay called Shangila as you enter the village from Villanueva side. It didn’t seem to have the same buzzing feel as the other villages but it was a Sunday so maybe during the week there would be places open to eat and/or stay. After restocking with water and having a rest from the midday sun we ambled over the bridge at the end of the village and started the last leg of the journey to Los Santos. 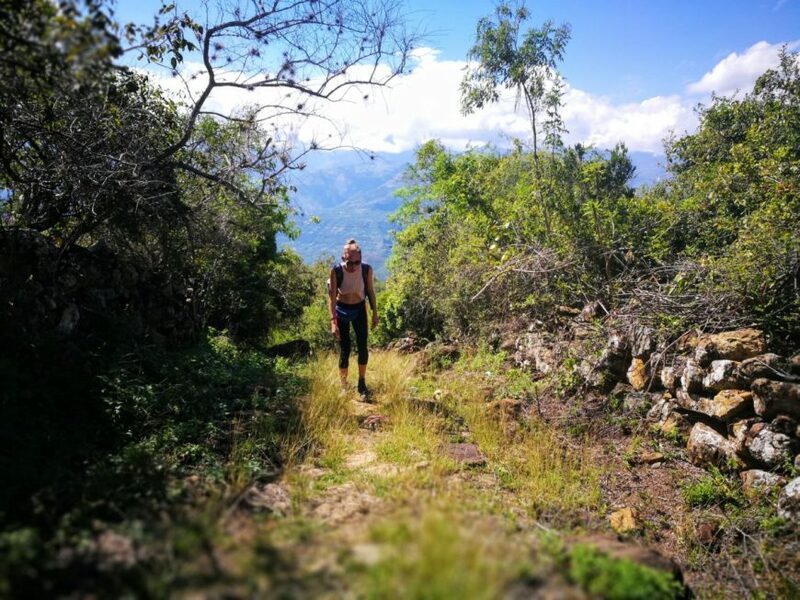 5.5km does not sound that far but this part of the hike is uphill all the way and in Colombia’s high temperatures it can be very dangerous, if you are doing this too please make sure as we did you have more than enough water and take regular breaks in the shade. We arrived in Los Santos and found the nearest shop to grab a refreshing drink, snacks and a well-earned sit down. Reflecting on an epic two days and a hike of a lifetime! We had a wander round Los Santos for an hour or so before looking to sort out transport back to San Gil. Buses run a few times a day from the main square back to San Gil and the local areas. 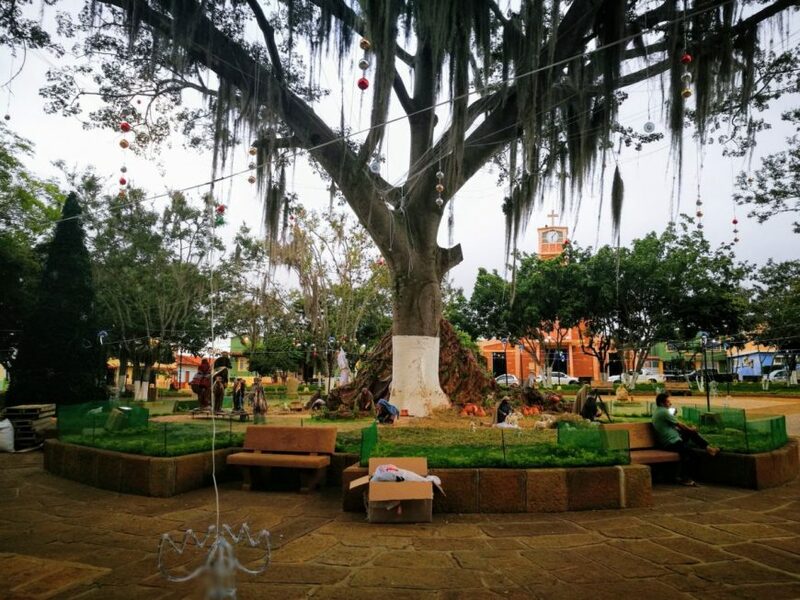 The bus transport office is right on the Parque Central square opposite the church. 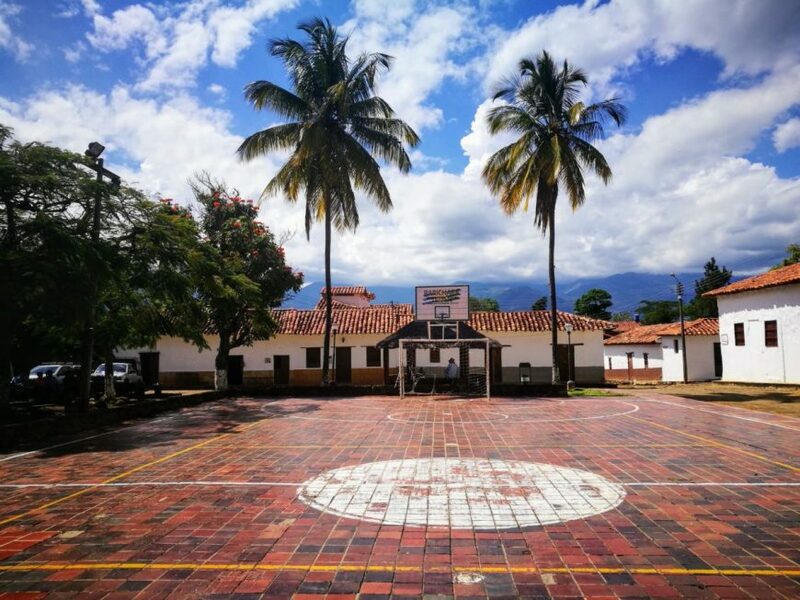 This was definitely one of our top highlights of Colombia, experiencing untouched villages and towns tucked away in the Santander countryside. 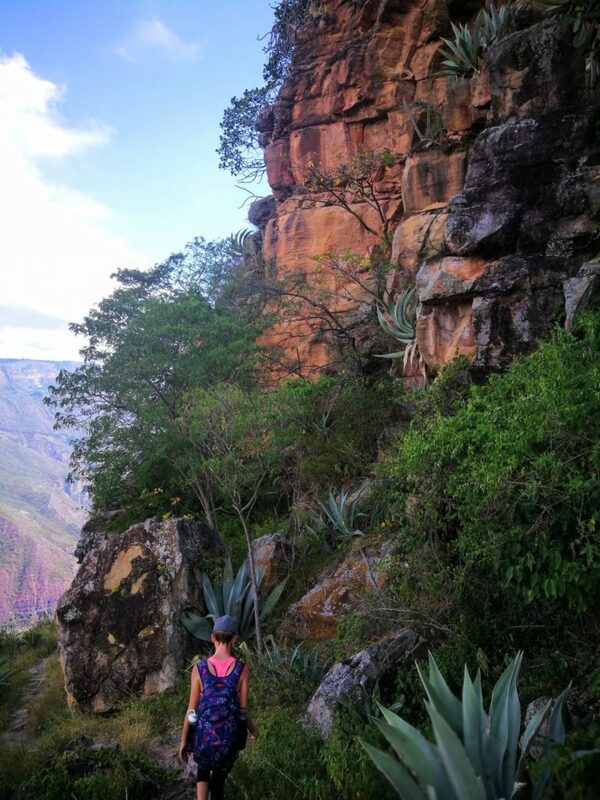 It was a breathtaking hike with stunning views and beautiful raw scenery. 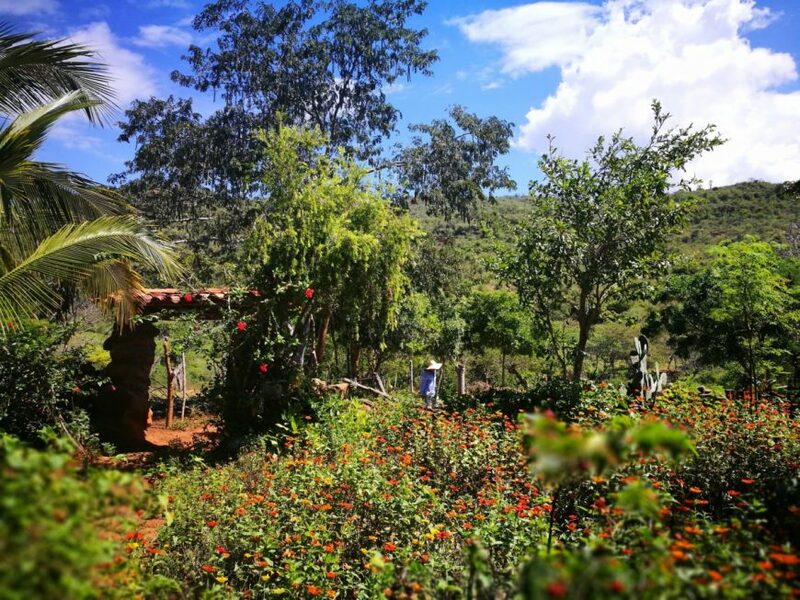 This is something that we will never forget; a true off the beaten path experience in the heart of Colombia. 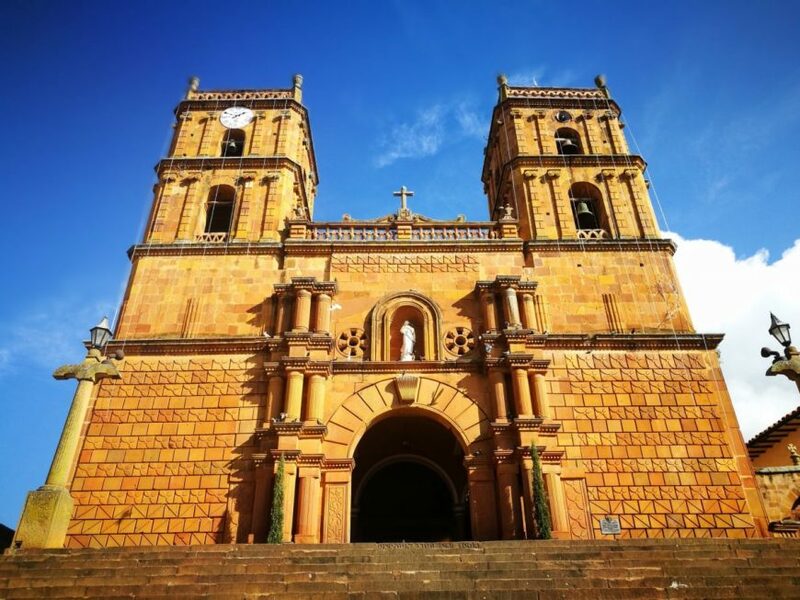 Thanks so much for reading, we hope we’ve given you inspiration to hike the Colombian Camino Real! 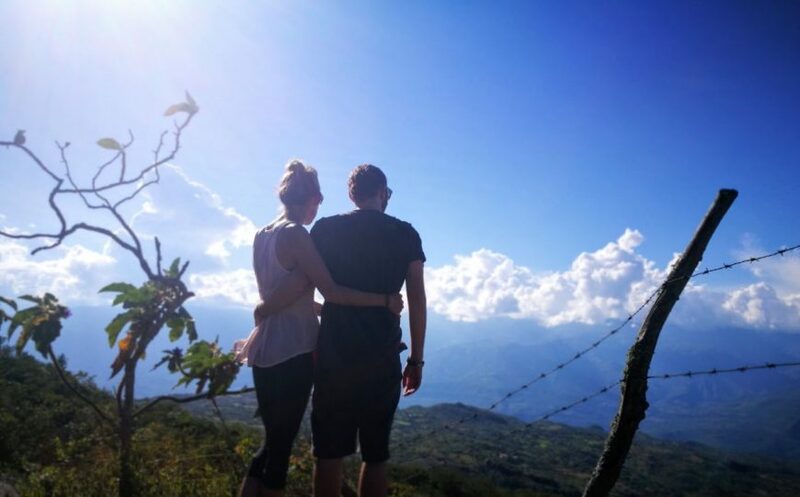 You can checkout the rest of our adventures in Colombia by clicking the link. 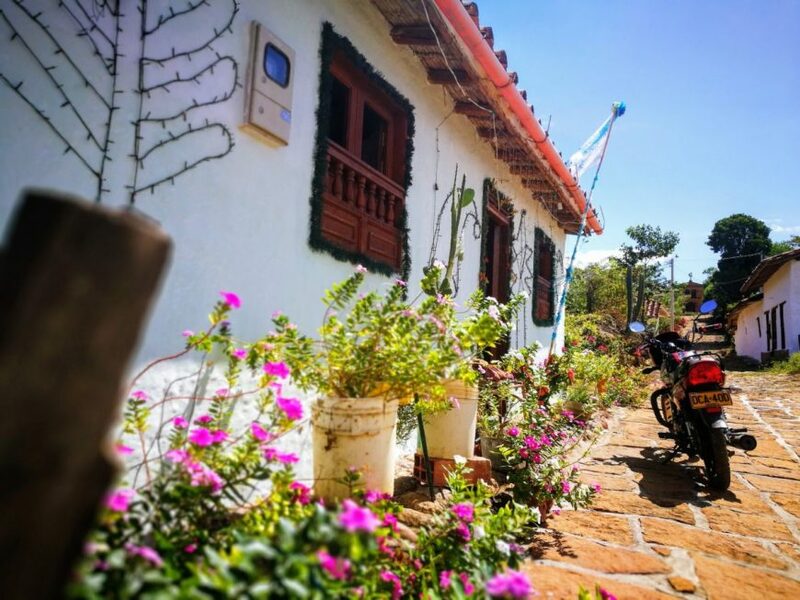 If you are heading on to Cartagena or Bogota checkout or posts of things to do when you get there! 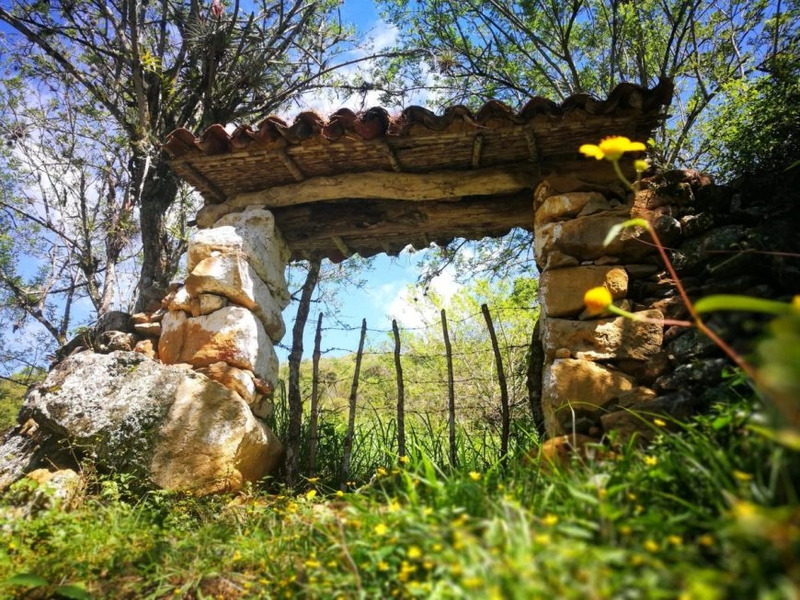 This entry was posted in Colombia, Hiking and tagged Camino Real. Away not only in scenery but the last ascent into Los Santos after 5 hours of hiking already In the heat. Ah wow that is amazing! Thanks Éric! Yes the scenery is awesome isn’t it so beautiful, glad you had such a great experience there. That definitely makes us happy! The heat also makes it that bit more challenging but so worth it. Thanks for this post. In the photos, you seem to be wearing day packs.. I’m wondering is how you handled your luggage/bags if this was a multi-day hike? Was there a way to have them sent ahead?